SUVs with giddy families primed for a weekend of water slides and lazy rivers clog the exit ramps—nothing unusual there. This is, after all, the famous summer resort, Wisconsin Dells. What is unusual is that it's February. And it's snowing. And it's 23 below with the wind chill factor. What are these people doing toting their bathing suits, swimming goggles, and ice scrapers? They're joining the indoor water park phenomenon that has transformed the Dells and altered the way travelers think about—and when they take—their vacations. With about 20 hotels luring guests to jump into their pools during what used to be the off-season, Wisconsin Dells is the world's chlorination capital. We're not talking about a Jacuzzi and a couple of floats tossed into a pool. The features vary from property to property, but some of the bigger resorts boast indoor water attractions that rival most outdoor water parks. Most of the indoor waterparks are restricted to the resorts' registered hotel guests. The Kalahari and Mt. Olympus parks sell day passes to the general public. Directions to Wisconsin Dells: From Milwaukee and Chicago areas: I-90 W towards Madison to Exits 87 or 92. From Minneapolis: I-94 E to Exits 87 or 92. Many of the parks open some outdoor pools (yes, they're heated) and Jacuzzis throughout the winter. There's nothing quite like sitting in an outdoor Jacuzzi during a snowstorm. Since man (and woman and kids) can't live on water alone, consider toting in your own food or shopping for some provisions for at least some of your meals. Most of the waterpark resorts offer in-room refrigerators, microwaves, and coffee pots. For dining out, the wonderful Field's Steak House at the Wilderness is among the Dells' finest, if priciest restaurants. For funky, exotic, eclectic, and absolutely scrumptious vegetarian fare, check out The Cheese Factory Restaurant. Water has long played an important role in Wisconsin Dells. About 150 years ago, boat tours began luring tourists to view the unusual sandstone cliffs along the Wisconsin River. A water ski show that debuted in the early 1950s still packs them in today. Duck tours, using the water/land vehicles that have recently become popular in many areas, debuted in the mid-1950s. And, of course, swimming has always been a popular Dells pastime. But swimming took a new twist in the 1980s when (outdoor) water parks opened, grew to gargantuan proportions and cast Wisconsin Dells as a water park haven. Many of the town's hotels also took the plunge and developed slides and other water attractions at their outdoor pools. In late 1994, the Polynesian Resort Hotel (palm trees in Wisconsin? You betcha!) unwittingly kicked off another water park revolution when it opened the area's first indoor water play area. "Basically, it all started as a mistake," admits Tom Lucke, former co-owner of the Polynesian. "We just wanted to shore up business in June. It's an iffy weather month and we thought this would guarantee weather-proof fun." During early 1995 however, word spread about the resort's indoor water activities and, much to his amazement, visitors began jamming the resort throughout the winter and into the spring. "The place went nuts," Lucke says with a laugh. "We thought, 'Hmm. Maybe we're onto something here.' "
Once other Dells hotel owners saw the stampede to the Polynesian during the traditionally dead off-season, it didn't take them long to build their own attractions. Over the course of a few years years, eighteen properties developed climate-controlled water elements--and the concept began spreading. 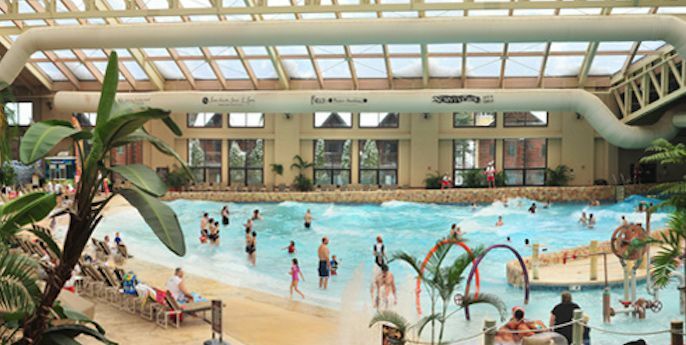 Today, indoor water park resorts can be found throughout North America and around the world. But Wisconsin Dells remains the water park epicenter.